ITBP Recruitment 2018 - Apply Online for 85 Constable (Animal Transport) Posts in ITBP, Dehradun, Uttarakhand on Temporary Basis. Online Applications are invited by Indo Tibetan Border Police from 15 Oct 2018 to 13 Nov 2018 11:59 AM for 85 vacancies. ITBP Constable Animal Transport Admit Card 2019: Indo Tibetan Border Police has issued the Admit Card on 19 Jan 2019 for Constable Animal Transport Exam 2019. Pay the Examination Fee through online payment gateway. To be completed within 4.45 minutes. Level - 3 in the Pay Matrix ₹21700 – 69100 (as per 7th CPC). Eligible candidates may apply online at ITBP's website (direct link is given below) from 15 Oct 2018 to 13 Nov 2018 11:59 AM. Candidates log on to http://itbpolice.nic.in/. 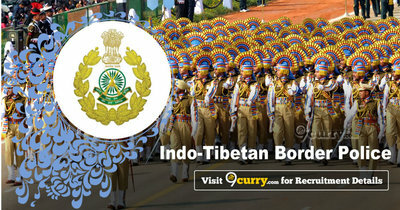 Click on “Click here ITBP Recruitment”, if you are a new user. ITBP Recruitment 2019 - Apply Online for 121 Constable/ GD Posts under Sports Quota in ITBP, Across India on Temporary Basis. Online Applications are invited by Indo Tibetan Border Police from 22 Apr 2019 to 21 Jun 2019 11:59 PM for 121 vacancies. ITBP Recruitment 2019 - Apply Online for 496 Medical Officer Posts in ITBP, Across India. Online Applications are invited by Indo Tibetan Border Police from 02 Apr 2019 from 00:01 AM to 01 May 2019 till 11:59 PM for 496 vacancies. ITBP Recruitment 2019 - Job notification for Dy. Comdt. (Armourer) Posts in ITBP, New Delhi on Deputation Basis. Applications are invited by Indo Tibetan Border Police on or before 02 Months from the date of publication of the advertisement in Employment News/ Rozgar Samachar for 4 vacancies. ITBP Recruitment 2019 - Job notification for Additional Judge Attorney General (Commandant) Posts in ITBP, Across India on Deputation Basis. Applications are invited by Indo Tibetan Border Police within two months from the date of publication of the advertisement in Employment News/ Rozgar Samachar for 4 vacancies.